My Articles is a new feature found on BrowZine Web and represents an enhanced version of what was previously called "Saved Articles" on iOS and Android devices. 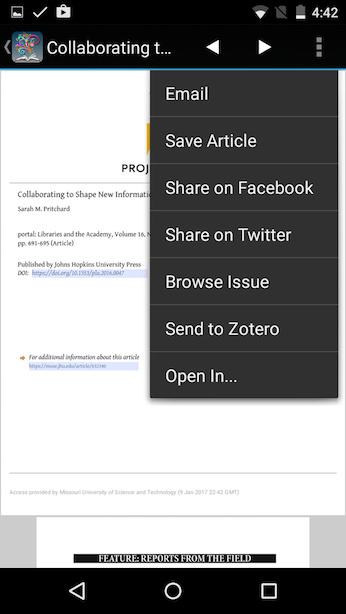 In short, you can now save articles you find on the Web, iOS or Android versions of BrowZine into one or many collections within My Articles which then syncs across all of the devices you are using via your BrowZine Account. The iOS and Android versions of BrowZine have the additional feature of being able to save full text PDF's for offline reading. Due to subscription content license limitations, BrowZine Web does not have this ability, but instead provides one-click access to the full-text content for the user who can download the article to their computer for safe keeping and offline use. Articles within the collections can be deleted, copied and moved to other collections and new collections can be created or deleted as well. Regardless of the device used for these operations, all changes are reflected within seconds across all devices, provided an internet connection is available. 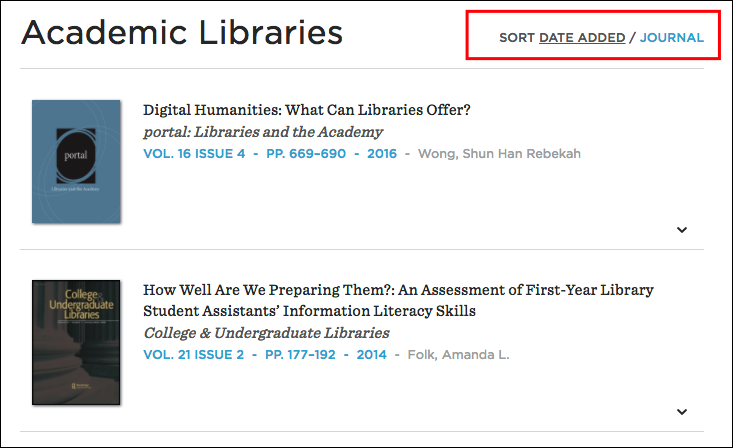 To get started using My Articles, simply find an article you are interested in, click the "expand" down arrow to the right of the article to reveal the various citation and article saving options. You will then be shown a menu where you can choose which collection(s) you wish to save it. Note: if you are not currently signed in with your BrowZine Account, you will first be asked to sign into (or create) your BrowZine Account first and then will be returned back to the "add article" screen. By default, the "General" collection is always selected and every user has one. The General collection can be renamed to whatever the user would like, but cannot be deleted as it acts as the "default" collection. You can also create a NEW collection when saving an article and save the article to that collection as well using an "Add Collection" option at the bottom of the list which you may need to scroll to see depending on the number of collections you have. Once saved, the article, in expanded form, will always note which collection(s) the article is saved in the for the user and will provide a quick link directly to that collection. You can also click on the tab at the top of the screen for "My Articles" at any time to view the various collections you have and the articles they contain. All of the same options on each article are visible using the expand arrow just like they were in the tables of contents for each journal. You can delete articles here by clicking on the "x" in the top right of each article row. A confirmation screen will appear confirming that you want to do this. 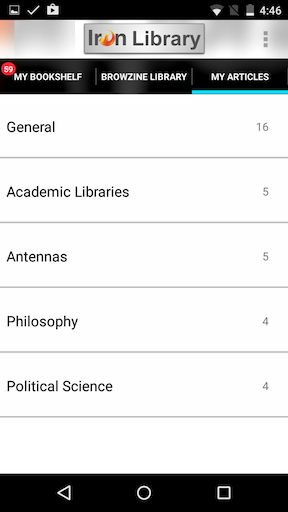 On the left you can also see all of your available collections and the number of articles they contain. You can also delete the collections here (except for the general collection, which cannot be deleted). 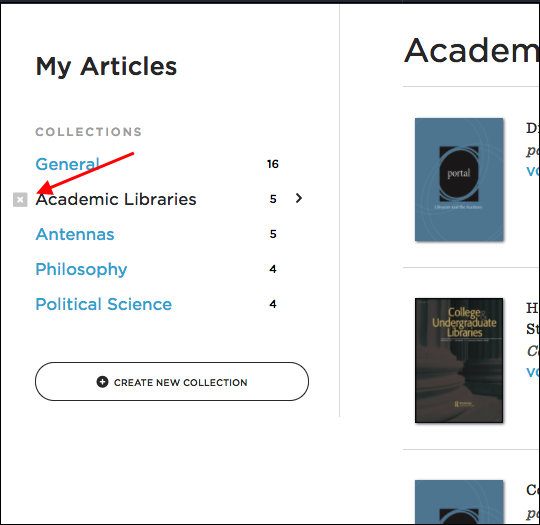 At the end of the list of collections you can click the button to "Create a New Collection" from the My Articles screen as well, just as you can when adding an article to a collection a tables of contents screen. ... as well as sort the articles by either the date the user added them to the collection or by the name of the journal, thereby grouping all articles from the same journal together within that collection. Clicking the articles brings you to the full text page at the publisher's site, but you can also click on the journal cover and/or name of the journal to be brought to the most CURRENT ISSUE available at your library or click on the SPEIFIC ISSUE that the article is from to load that SPECIFIC ISSUE as well. You can add new collections by clicking on the "+" icon in the top left and you can use the Edit button in the top right to delete those collections and all the articles they contain. 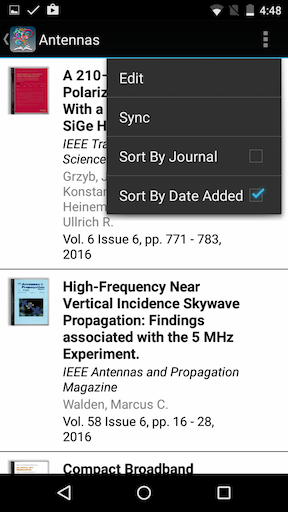 Within each collection, you have similar options to that of BrowZine Web in that you can sort by Date Added or Journal, and tap through each article to get to full text. 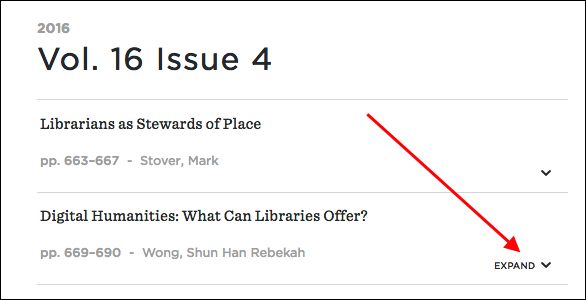 You can also tap on the journal cover to get to the most current table of contents available at your library. 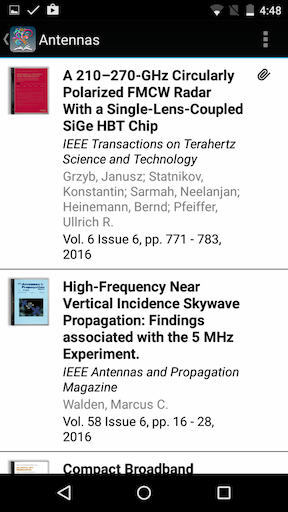 Unique to iOS and Android, you will notice that some articles may have a paperclip icon next to the article. This indicates that those articles are available for off-line reading. Articles saved into My Articles on the iOS device automatically get this paperclip icon and are available offline. However, articles that were saved on another mobile device or BrowZine Web will only have the citation as the full text is NOT synched across the web for publisher license reasons. If you do want the full text available for offline reading, simply click to download and view the article. You will not need to save the article again since it is already in My Articles and thus the next time you view the article within the collection you will notice the paperclip has been added automatically and is now available for offline reading. By tapping the edit button in the top right the user can do a number of different actions to organize their collection including renaming the collection, and singly or in bulk deleting, copying or moving articles from one collection to another. Remember that any organizational changes made on this device will also be reflected on all other devices utilizing the same BrowZine Account. Note: You will notice that the iPhone and iPad versions of My Articles look slightly different. Following the treatment of Apple's Mail app, the extra screen space for the iPad is used for a two-column view so that the user can see both the collections and the articles at the same time. On the iPhone, the user will be moving between each view. The user will have the option to save it in the General Collection or to any other collections they have created. You can add new collections by tapping on the options in the top right as well as use options for deleting. 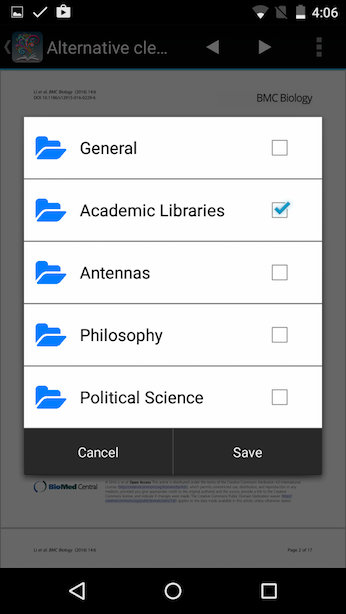 By tapping the options button in the top right the user can do a number of different actions to organize their collection including singly or in bulk deleting, copying or moving articles from one collection to another. 1. I've been a BrowZine user for a long time... what is going to happen to the articles I have already saved in "Saved Articles" on my iOS/Android device? After you download the new version of BrowZine which has the My Articles feature and attempt to use the My Articles tab or save an article you will be prompted to migrate your saved articles over to My Articles. This will essentially bring the data off your local device and host it in the cloud so that all your devices can see these articles. This is a one time and required process and it should take only a few moments with reasonably fast internet. If the internet connection is not adequate, BrowZine will prompt you to try this procedure again when it is. 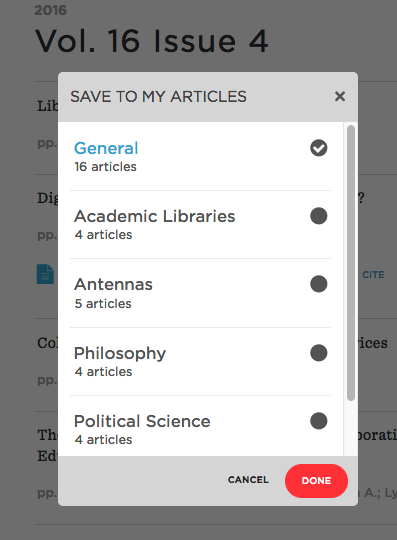 All of your articles will be added to the "General Collection" (since in the "Saved Articles" world there were no separate collections) but then after that users can move or copy them into other collections they create on any platform. For new users of BrowZine, a user will be prompted to create a BrowZine Account when they try to use My Bookshelf or My Articles on the web or mobile platforms and there will be no migration necessary since no data yet exists. 2. Is there a maximum number of articles that can be saved in My Articles? There is a maximum of 500 articles allowed to be saved in My Articles presently, though this number may increase in the future. No problem! Please contact us at support@thirdiron.com and we would be happy to assist!